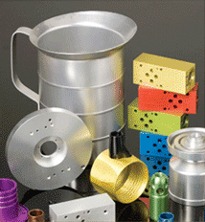 The anodizing process involves a complex sequence of events that must occur under carefully controlled conditions. Each alloy and shape anodizes differently. Part preparation, chemical compounds, electrical current and temperatures are critical to the process. It takes skilled craftsmen and sophisticated equipment to get high quality and consistency from the process. 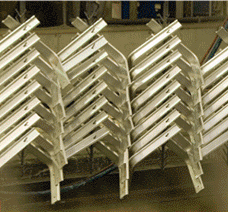 Fort Wayne Anodizing is one of the most sophisticated and experienced anodizers in the country. Testing and research and development are managed in-house to ensure the quality control of each process. The use of SPC (statistical process control) allows our technicians to eliminate the causes of any variation in the processes or production and make adjustments to assure high quality and consistency. Our production lines have been engineered to provide extraordinary quality while providing the capacity to handle just about any job you require. Fort Qayne Anodizing can handle parts as small as a rivet to parts that are more than 20 feet long weighing as much as 800 lbs. Fort Wayne Anodizing can run just a few parts or as with many of our customers, production runs, where we anodize the same product every day. Maintains four separate Type II anodizing lines, each self contained with its own rectifier and cooling system.